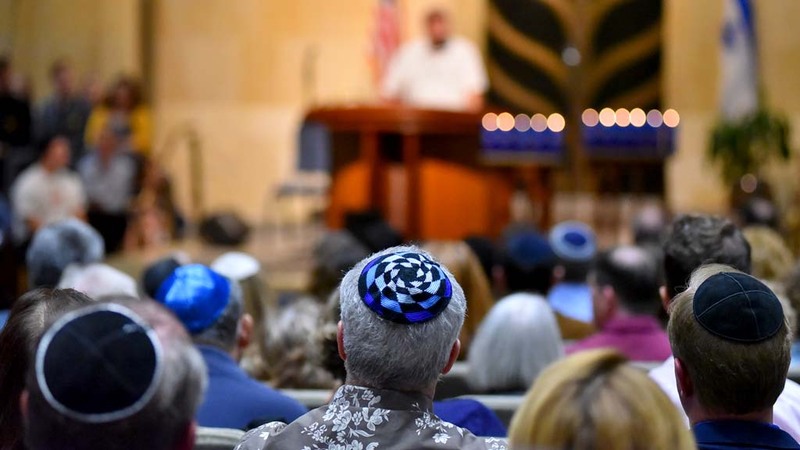 San Diego is 2,450 miles from Pittsburgh, but the psychological distance Monday was zero as representatives of many faiths filled Congregation Beth Israel’s sanctuary and social hall to overflowing. 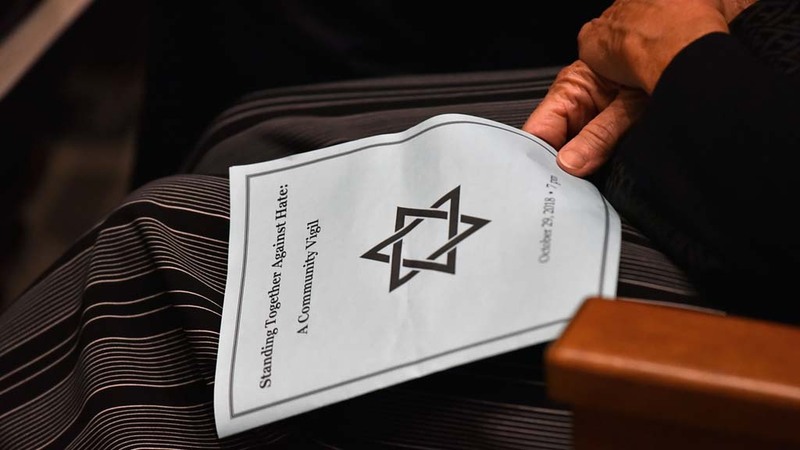 A vigil service expressed solidarity with the congregants of the Tree of Life Synagogue in Pittsburgh, where a white supremacist gunman killed 11 Sabbath worshipers and wounded four law enforcement officers who rushed to their aid. 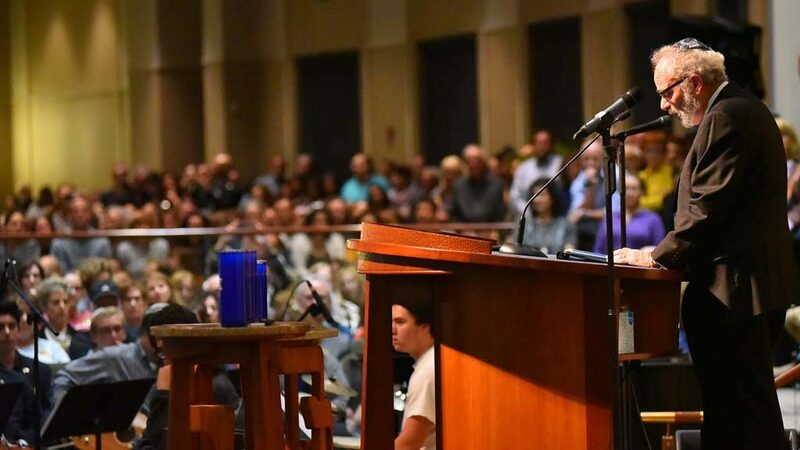 Normally, Beth Israel’s combined sanctuary and social hall can hold between 1,200 and 1,300 worshipers, according to the Reform congregation’s former president Jerry Goldberg. People stood around the periphery of the two rooms, and aisles had to be cleared in observance of fire safety laws. Mourners were directed to the patio outside, where loudspeakers carried the audio from the service. 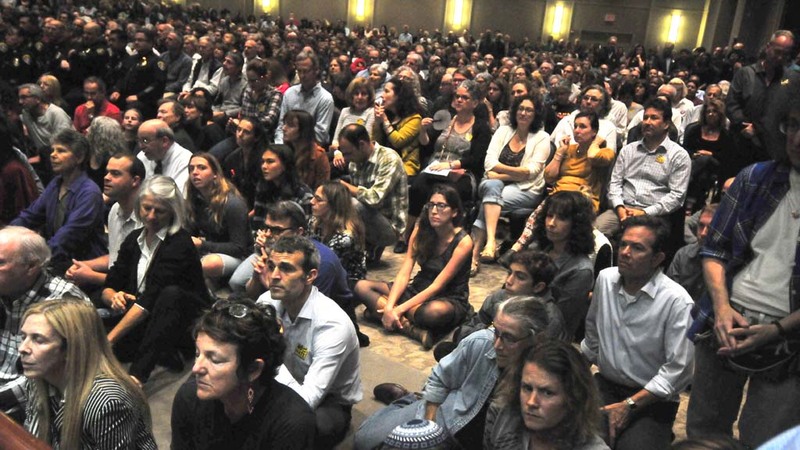 Lesley Mills, the temple’s executive director, estimated 400 outside — not counting dozens at the foot of the stairs, where a Chabad choir serenaded them. Other latecomers were apologetically turned away, with the explanation that there was just no more room. Who knows — perhaps there was at least one person there for every one of the 2,450 miles between the two cities. 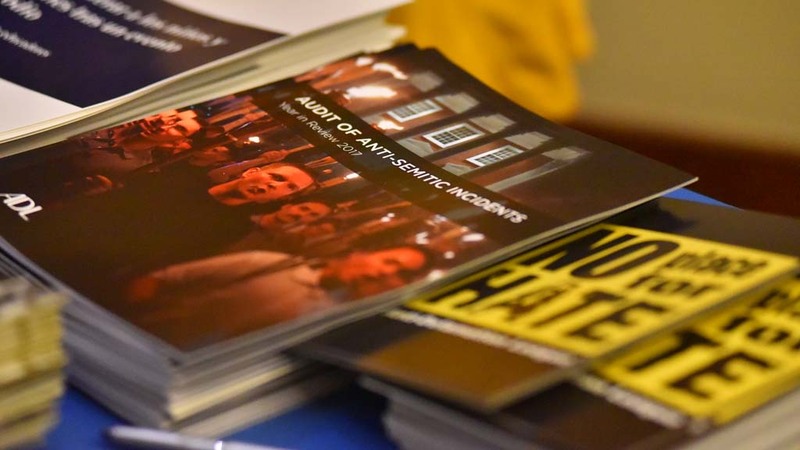 The program was rich and varied, showcasing diversity both in the Jewish and general communities. 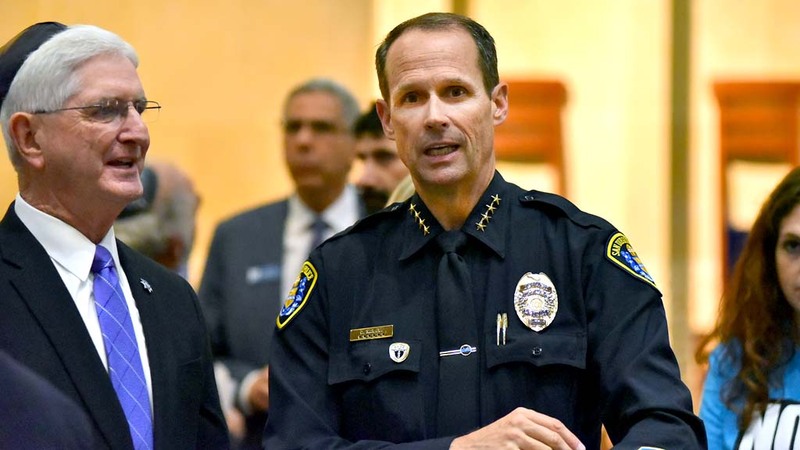 Besides Jewish speakers were representatives of the Muslim and Sikh communities, who received thunderous applause, as did San Diego Police Chief David Nisleit, who represented law enforcement who run toward gunfire, not away from it, in an effort to protect their fellow American citizens. 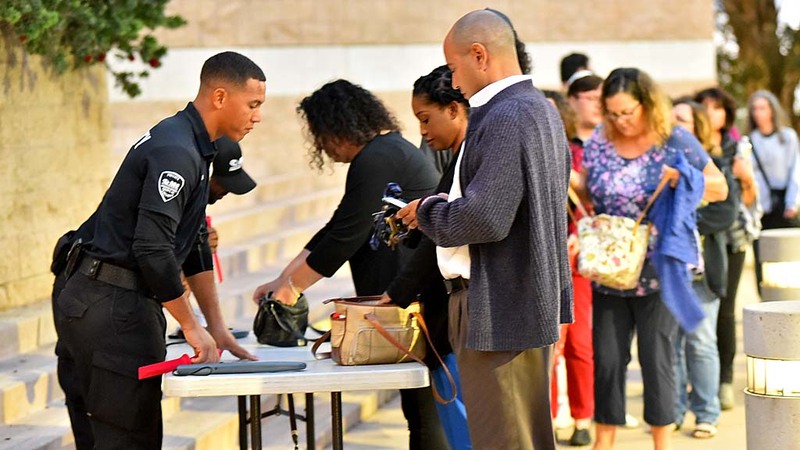 Also attending were Reps. Susan Davis and Scott Peters, Assemblyman Todd Gloria, San Diego City Council members Barbara Bry and Lori Zapf, San Diego Unified schools Superintendent Cindy Marten, Sheriff Bill Gore and District Attorney Summer Stephan. 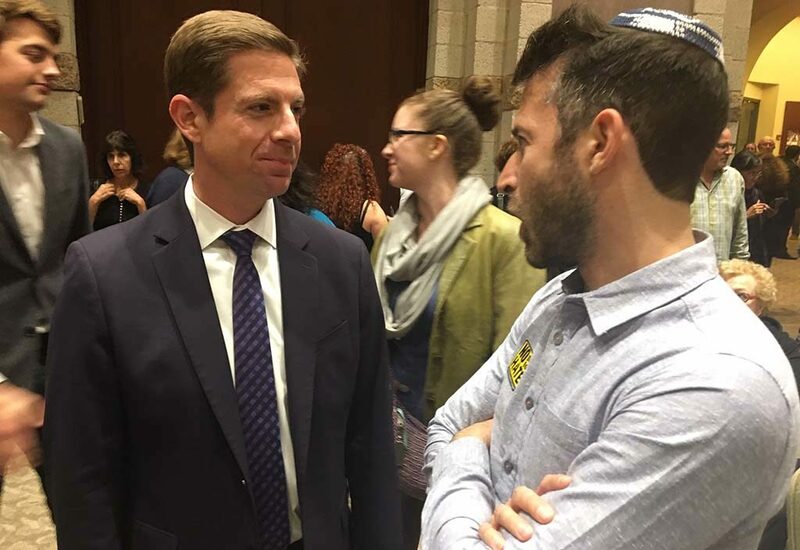 Stephan’s predecessor, Bonnie Dumanis, was there, too, along with several other local and national candidates including 49th District Democratic hopeful Mike Levin, 50th District Democratic challenger Ammar Campa-Najjar and La Mesa City Council candidate Dave Myers. 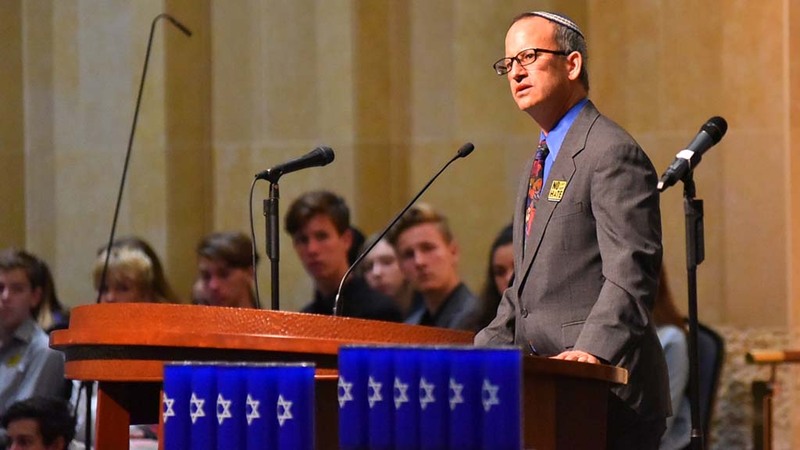 Rabbi Michael Berk, senior rabbi of the host Beth Israel congregation, Cantor Billy Tiep of Temple Solel, Rabbi Jeremy Gimbel of Congregation Beth Israel, and Rabbi Devorah Marcus of Temple Emanu-El represented the Reform movement with speeches and song. 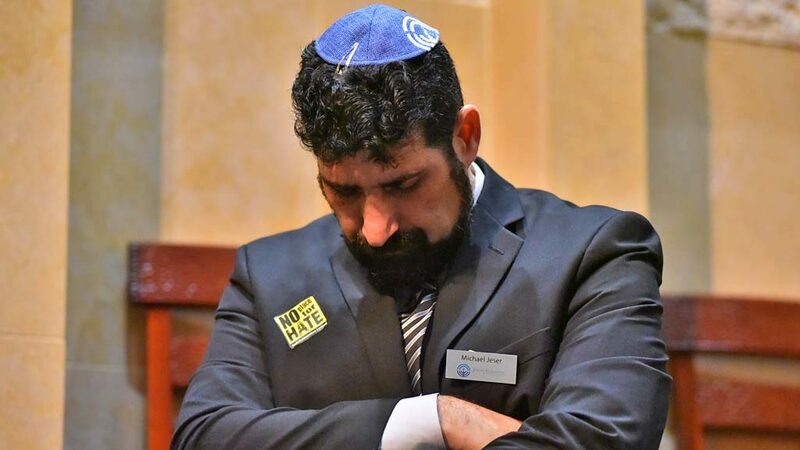 Rabbi Yael Ridberg of Congregation Dor Hadash was there for the Recontructionist branch, and Rabbi Scott Meltzer of Ohr Shalom Synagogue represented Conservative Jews. 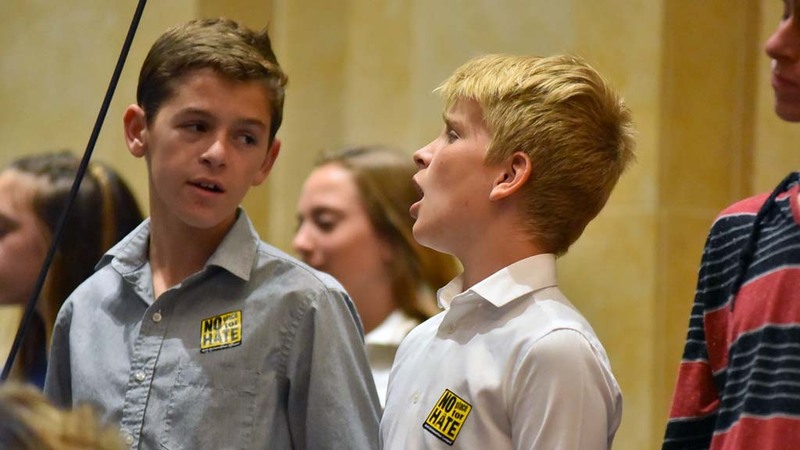 Student choirs from Temple Solel, Congregation Beth Israel and Temple Emanu-El sang inspirational songs. 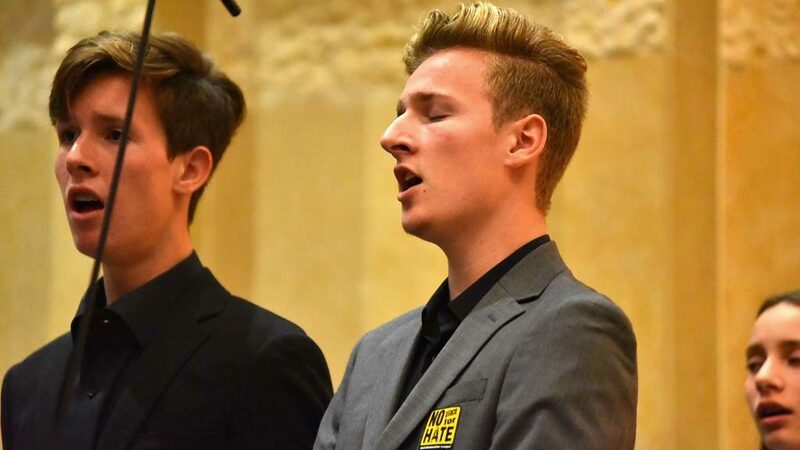 There were also representatives of Jewish agencies such as Michael Jeser, CEO of the Jewish Federation of San Diego; Michael Hopkins, CEO of Jewish Family Service; and Tammy Gillies, regional director of the Anti-Defamation League, who emceed the program and was credited as the organizer of the event. 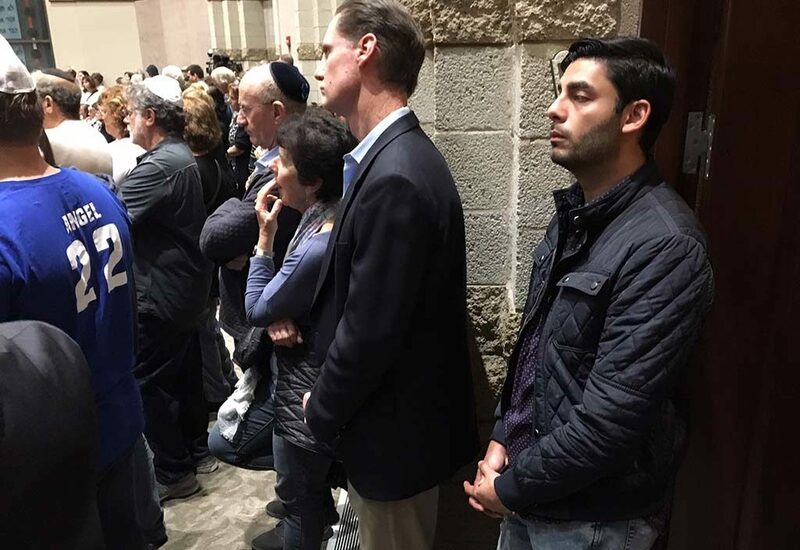 Perhaps some of the crowd’s warmest applause was bestowed on speakers from outside the Jewish community who came to voice solidarity and say the attack in Pittsburgh was not just an attack on Jews, but an attack on America and its values. 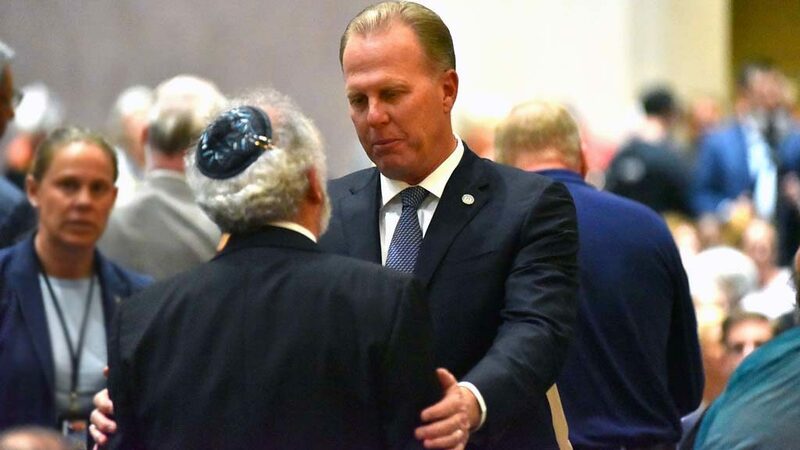 These speakers included San Diego Mayor Kevin Faulconer, surrounded by a bipartisan phalanx of elected officials from the local, state, and federal levels; San Diego Police Chief Nisleit, Imam Taha Hassane of the Islamic Center of San Diego, and Gagandeep Kaur, a representative of San Diego’s Sikh community. As diverse as the bima players were, so too was the audience. 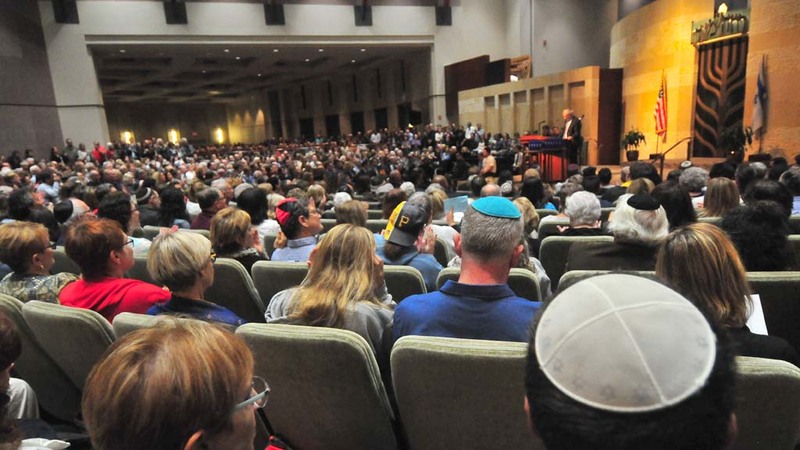 In the row where my wife, Nancy, and I sat, by chance our immediate neighbors were a Muslim man, a Christian woman and a Jewish woman from Congregation Beth El who originally hailed from Mexico. Later in the service, religious leaders of every persuasion filled the bima and its wide wings. 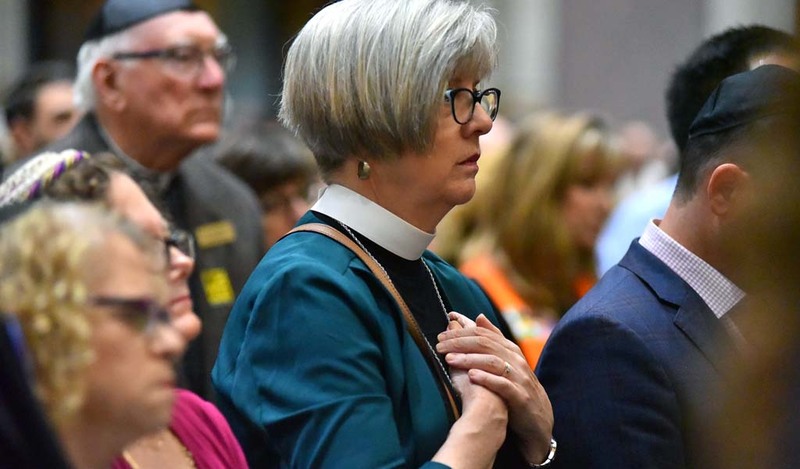 While no Christian representative had a speaking part, representatives of numerous Christian denominations were present, with Msgr. 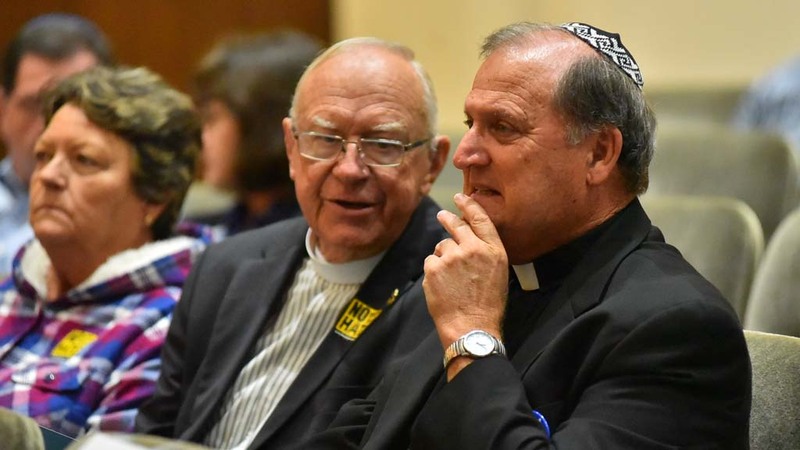 Dennis Mikulanis, vicar of interreligious relations for the Roman Catholic Church, singled out by name. 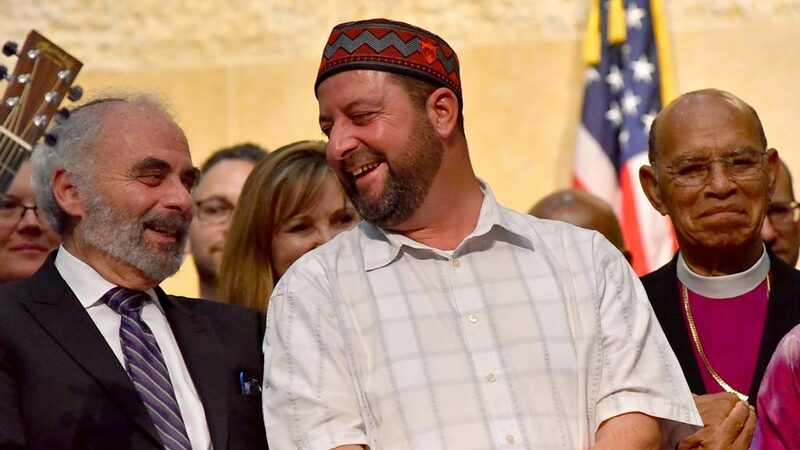 Yusef Miller, seated next to me, came as a community outreach liaison of the Council on American Islamic Relations (CAIR), a group not without its detractors in the pro-Israel community. Nancy Becker of the Lamplighter Revival Center, a nondenominational Christian church in El Cajon, also was seated in our row. 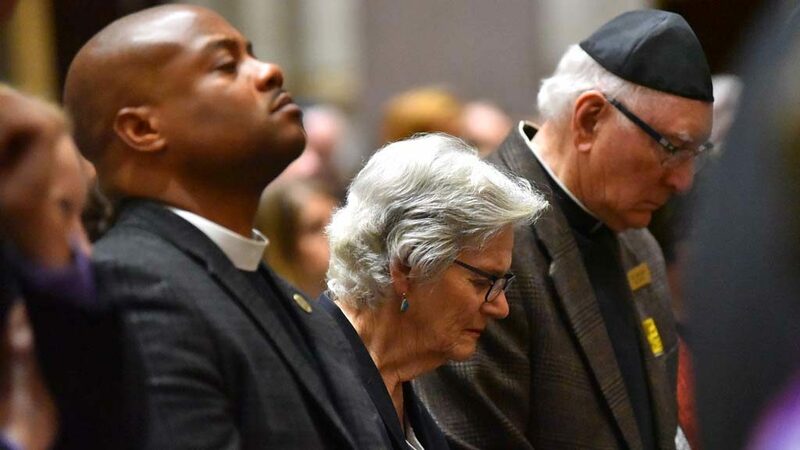 Representatives of the National Youth Leadership Mission, their presence bespeaking America’s racial diversity, lighting 11 memorial candles for each of the murdered congregants of Pittsburgh’s Tree of Life Synagogue: Joyce Feinberg, 75; Richard Gottfried, 65; Rose Mallinger, 97; Jerry Rabinowitz, 66; Cecil Rosenthal, 59; David Rosenthal, 54; Bernice Simon, 84; Sylvan Simon, 86; Daniel Stein, 71; Melvin Wax, 88; and Irving Younger, 69. Cantor Billy Tiep chanting the mournful prayer for the dead, El Moleh Rachamim. Thunderous applause for the nation and San Diego’s law enforcement officials, the latter of whom provided tight security for the evening’s gathering — in uniform and out. 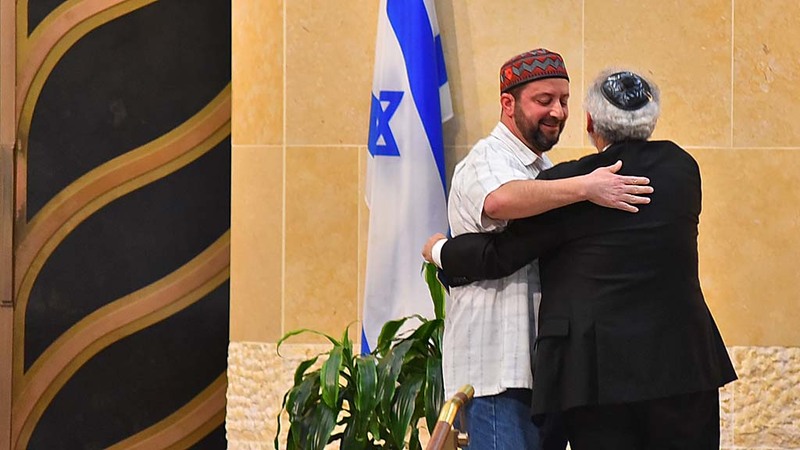 The crowd rising as one to greet Imam Taha Hassane, his Muslim skullcap juxtaposed against the Holy Ark’s curtain picturing a menorah growing as branches out of a Tree of Life. 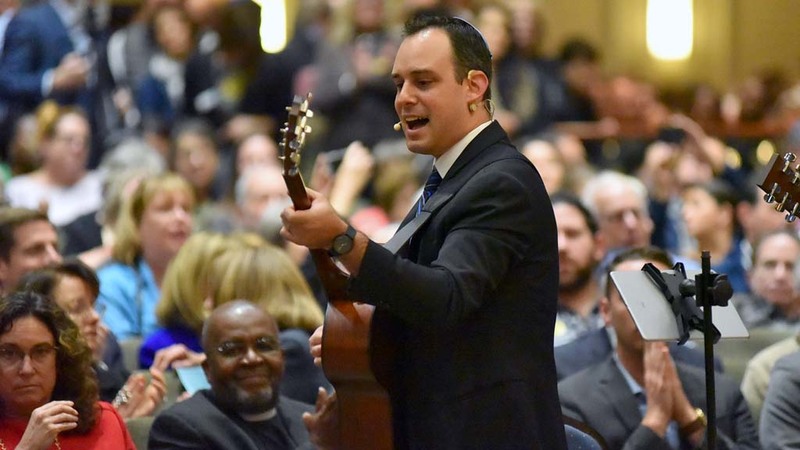 Rabbi Ridberg leading the congregation in the Mi Sheberach song by Debbie Friedman in which we solicit God to grant healing to those who were wounded, some still recovering in the hospital, from the Sabbath massacre. 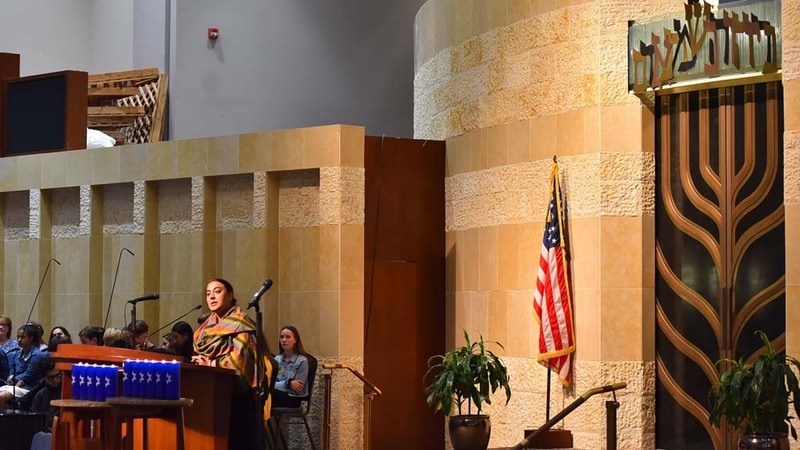 Sikh spokeswoman Gagandeep Kaur telling how the Jewish community was among the first to respond with warmth and sympathy after six Sikh congregants were killed and four others wounded in August 2012 while at prayer in a gurdwara (temple) in Oak Creek, Wisconsin. 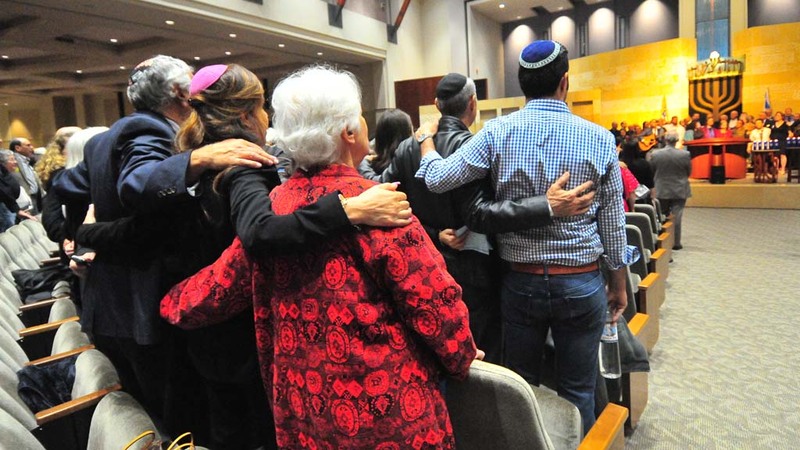 The entire assemblage linking arms and singing a national hymn written by a former refugee and immigrant, the Jewish composer Irving Berlin: “God Bless America.” Personally, I have to admit, seeing so many people of so many different background singing together brought tears to my eyes. 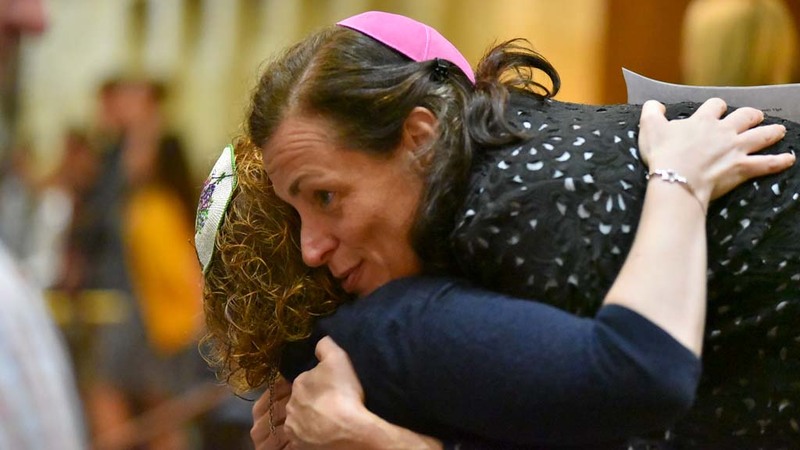 And Rabbi Devorah Marcus urging the assembly to subscribe to a newspaper, to vote in the midterm elections Nov. 6, and to reach out to someone outside of each individual’s comfort zone. 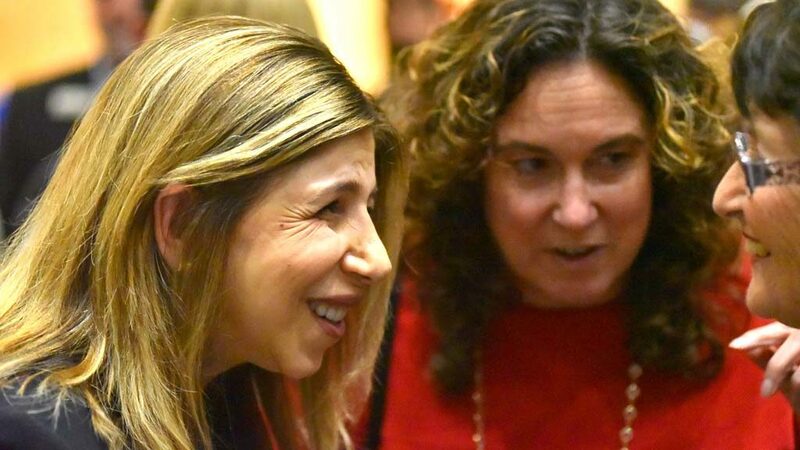 She counseled that Republicans should befriend Democrats and vice versa, and Jews and Muslims should reach out to each other (and not discuss Mideast politics for the moment). Following are brief excerpts from each of the speakers, in order of their appearance. 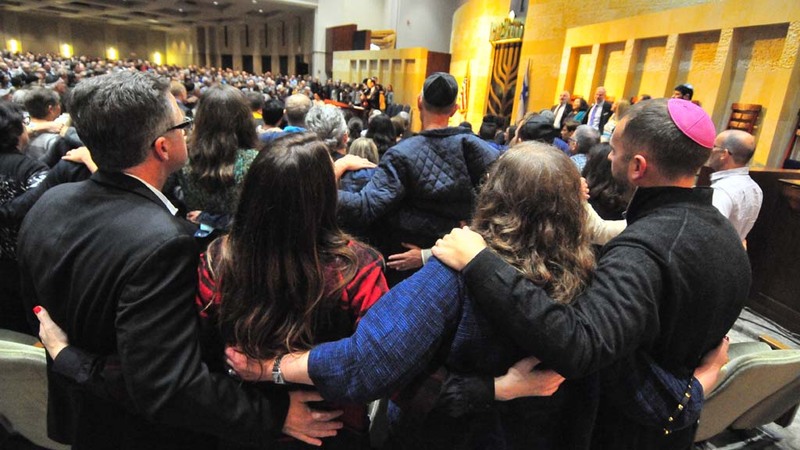 Rabbi Michael Berk: “It is moments like this that we feel that we are Am Echad, one people. The attack in Pittsburgh was an attack on all of us. 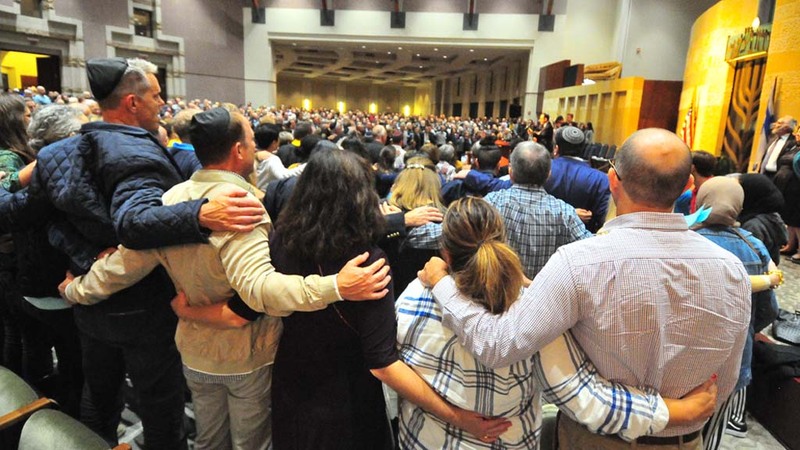 The Pittsburgh Jewish community begins sitting shiva tomorrow (Tuesday) with the first funerals and we will be with them in spirit. Rabbi Scott Meltzer: “Just as a candle gives light and warmth to this world, each and every human being is God’s light, God’s warmth to this world. When a candle is extinguished, all of the light and all of the warmth that that candle has brought into the world remains in this world. 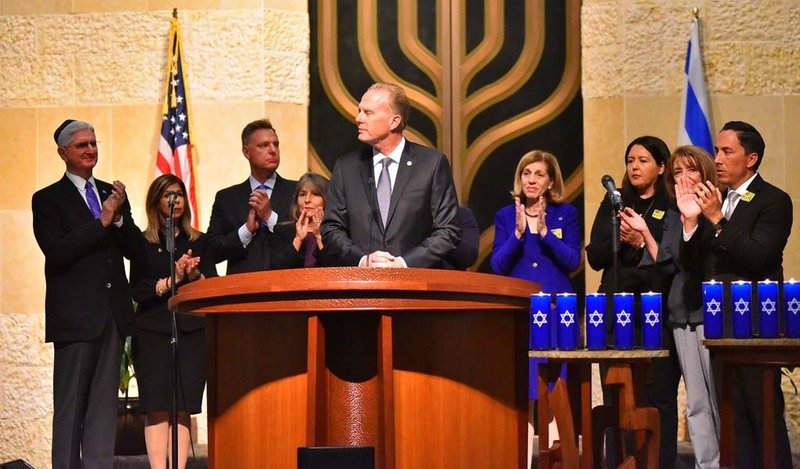 Mayor Kevin Faulconer: “Tonight we join together not only as San Diegans but as Americans, Americans of all religious beliefs, races and cultures to stand with our brothers and sisters in Pittsburgh. 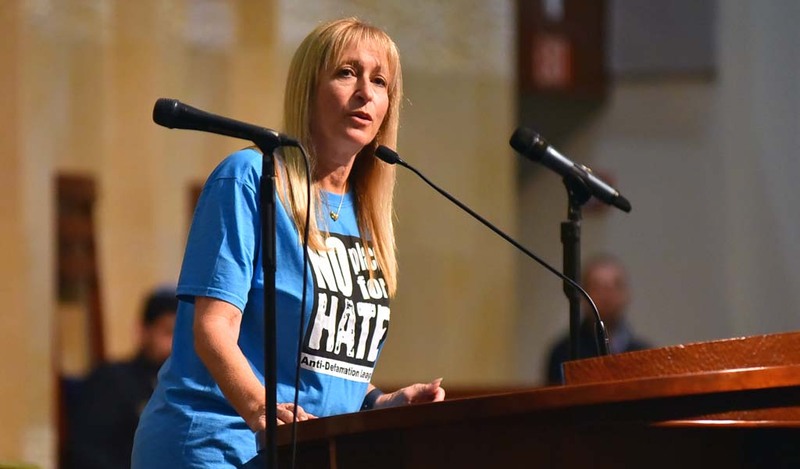 ADL Regional Director Tammy Gillies (wearing a T-shirt saying “No Place for Hate”): “This T-shirt, this is who I am; this is what ADL does”. 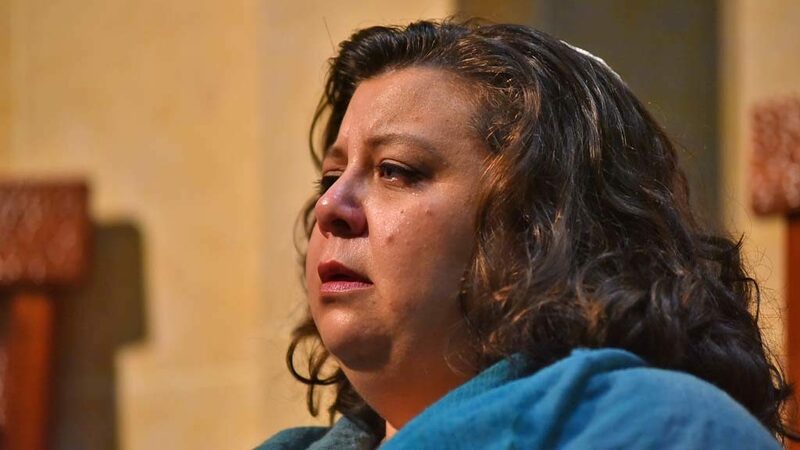 (Her reaction to the massacre): ”I’m shocked, I’m appalled, I’m sick, I’m heartbroken, but I am not surprised, and if you sat at my desk at ADL for a week, you would not be surprised either because this is what happens when hate is left unchecked, when we dehumanize people; when we call people ‘termites’ and use the word ‘infestation’ about immigrants. 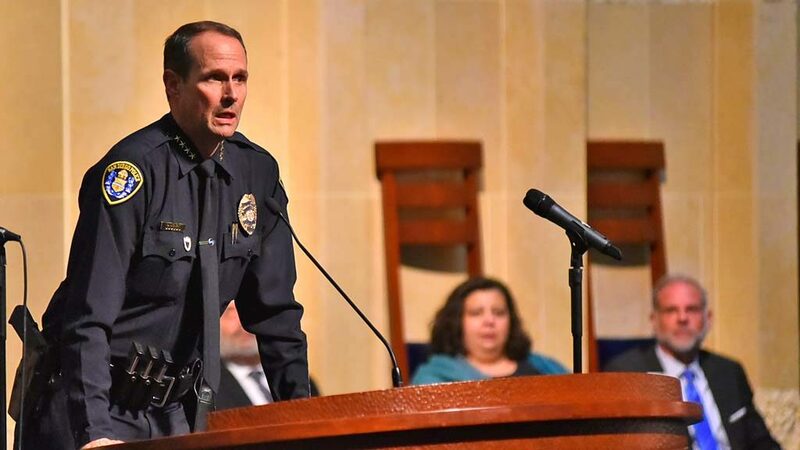 San Diego Police Chief David Nisleit: “The message I want to send is your local law enforcement, your federal law enforcement and your state law enforcement [are] here with you and will always be with you. 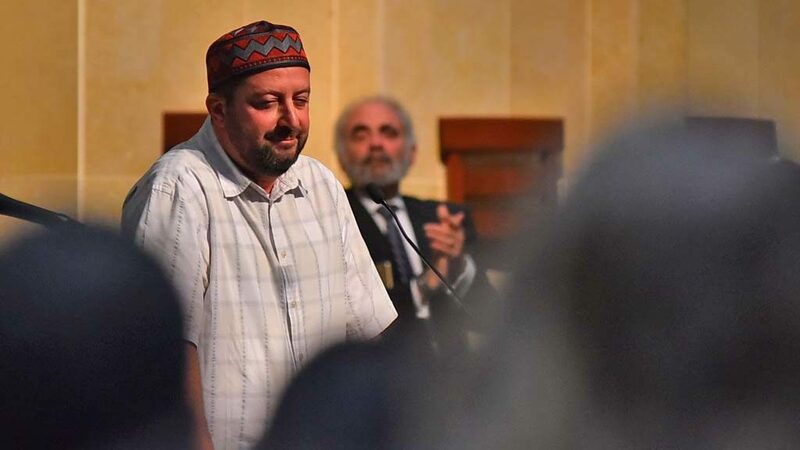 Imam Taha Hassane: After reading in Arabic from the Koran, he explained that the passage speaks of the two sons of Adam (Cain and Abel) adding that Allah said that “’because of this, we have commanded the children of Israel that killing one soul is as killing the entire humanity and saving one soul is as saving the entire humanity,’ which means that Almighty God wanted this teaching to be universal, to be embraced and implemented by all the people of the world, all the nations who came after the nation of the Children of Israel, including the nation of the Prophet Muhammed, Peace be Upon Him. Jewish Family Service CEO Michael Hopkins: “If you are not Jewish, I want to thank you tonight for being here. We stand tonight for all people feeling vulnerable in our communities. We stand up and we say ‘Enough! 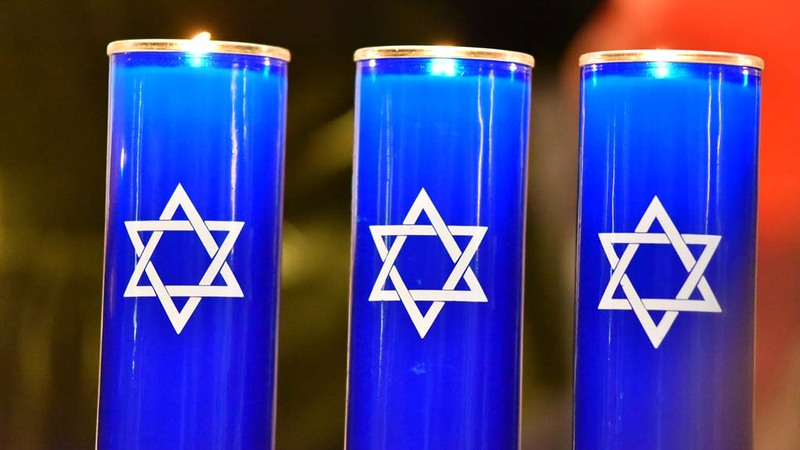 Enough!’… I knew two of the individuals who were senselessly murdered: Cecil and David Rosenthal. “They were brothers. David and Cecil participated in a group that I led [at the Squirrel Hill JCC in Pittsburgh] for special needs adults. I wasn’t surprised to learn that they were in temple. 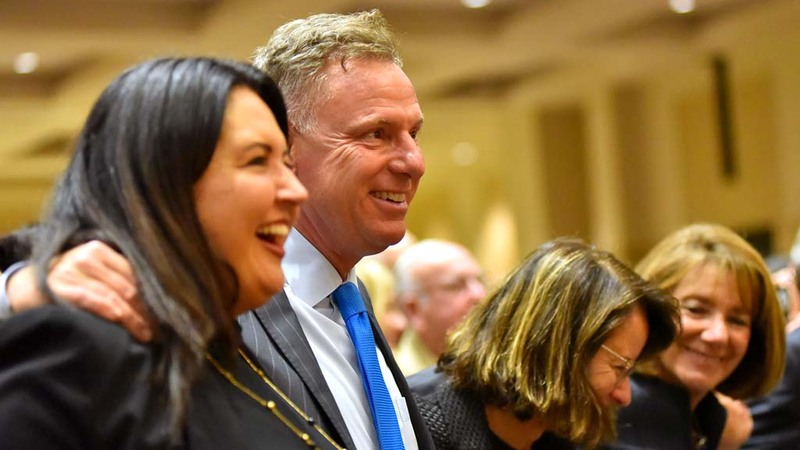 They loved shul – they would have called it a shul. 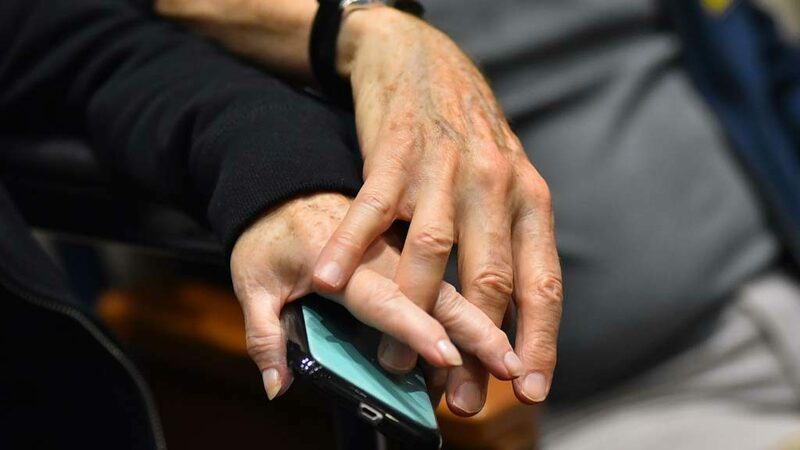 They loved their connection to their fellow congregants. They loved being Jewish. “It made them feel that they were bigger than themselves. 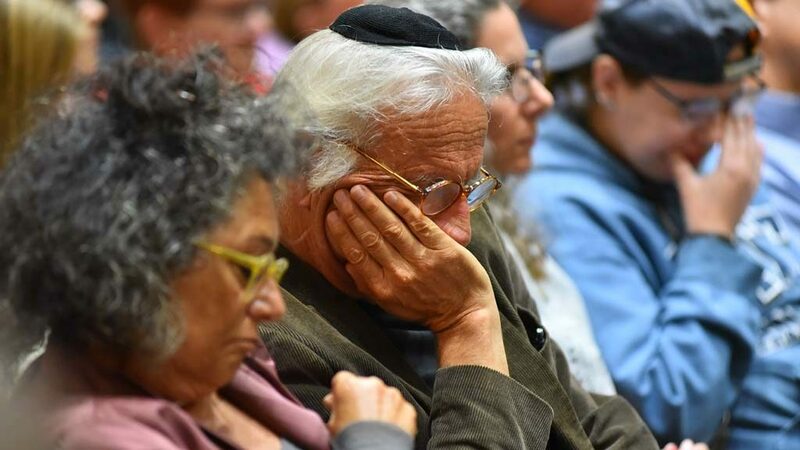 They were part of a community that loved them … Many of you are aware that the alleged perpetrator selected the [Tree of Life] Synagogue because it had participated in the HIAS Refugee Shabbat. Most of you know that at JFS, HIAS [formerly, Hebrew Immigrant Aid Society] is our national partner in our refugee and immigration work. Rabbi Devorah Marcus: (After inviting all the clergy in the sanctuary to come up with her on the bima), she said, “Just six weeks ago, give or take a day, we observed the Jewish Holy Day of Yom Kippur in which we asked God to help us atone for the words that we have spoken that we didn’t mean …and the words we said that never should have come out of our mouths. 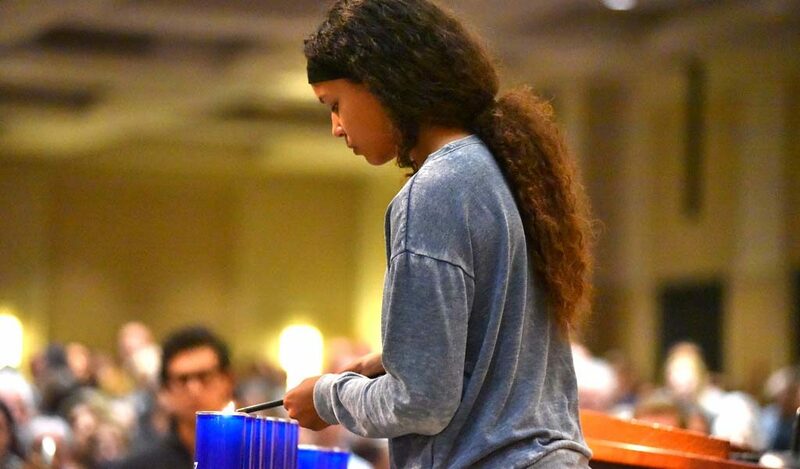 “According to our Jewish tradition, God weighs, measures and counts each and every word that passes through our lips. They have value, they have significance, and they create and build reality. 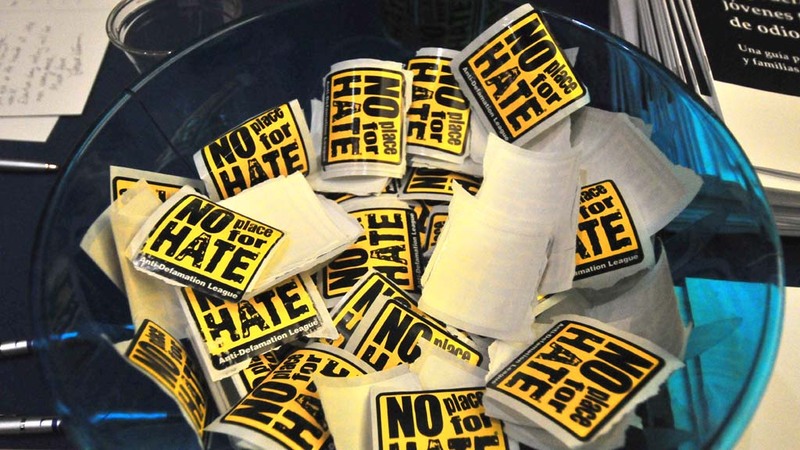 It is unacceptable in our world for our leaders to peddle hate. Don Harrison is editor of San Diego Jewish World, where a version of this report first appeared. He may be contacted via donald.harrison@sdjewishworld.com. Times of San Diego’s Ken Stone contributed to this report.